Tomorrow night Representative Brad Hill and I will be hosting an open-to-the-public conference for constituents and municipalities interested in learning more about Post Employment Benefits. The conference is scheduled for Wednesday, March 30th from 7:00pm-9:00pm at the Manchester Essex Regional High School. The event will feature special guest speakers Michael Widmer of the Massachusetts Taxpayers Foundation (MTF) and Andover Town Manager Reginald “Buzz” Stapczynski. Widmer, a well respected policy and financial analyst in the state, will discuss a report commissioned by the MTF examining the costs of post employment benefits on municipalities. Stapczynski has been a town manager for 30 years for Andover and Wilmington and has had tremendous success tackling the issue head-on. Attendees of the conference will also have the opportunity to discuss post employment benefit obligations municipalities shoulder and methods for minimizing the financial impact on a city or town budget. Posted below is a flyer detailing the event. I hope to see you there! The scheduling of hearings by the Joint Committee on Transportation is a welcome development which is timely, relevant, and critical to the improvement of commuter rail service in Massachusetts. Given the many problems commuters have experienced over the past several months with serious delays and missed runs, concerted action is needed to development and implement solutions. Chairmen McGee and Straus are taking prompt and appropriate action by scheduling these hearings expeditiously, and by providing accommodation for the public in the process. Those who depend on the MBTA deserve to hear about what's being done to address their concerns, and should also have a role in informing future decisions about making the system better. I encourage those interested to take advantage of the opportunity the committee is providing by attending the hearings and/or sending written testimony to the committee. Click here for a list of members who serve on the committee, and posted below are the details of the hearings, a letter sent to the committee from the Senate GOP caucus urging for the oversight hearings, and two recent articles by the Gloucester Daily Times and Lowell Sun detailing the developments surrounding the issue. This morning I was a guest on Fox 25’s Morning News Segment “Tolman and Gray”. Former State Senator Warren Tolman and I discussed President Obama’s decision to commit United States' military forces to action involving Libya with news anchor Kim Carrigan. To view our lively discussion, please play the posted video below. Tomorrow at approximately 10:00am I’ll be on the radio program Grecian Echoes with host Ted Demetriades of WNTN 1550AM. Ted and I will be discussing an upcoming event sponsored by The Annunciation Greek Orthodox Cathedral of New England scheduled for March 31st at 7:00pm where the focus will be “The Halki Theological School: Past, Present and Future". Please see a flyer of the event posted below. 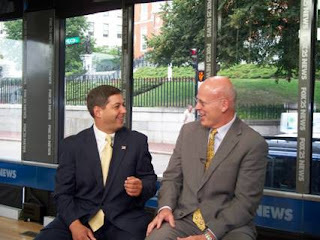 Tomorrow morning I’ll once again be appearing on the Fox25 Morning News segment “Tolman and Gray” analyzing the latest political topics with former State Senator Warren Tolman. Some of the topics that we may discuss include the recent decision by the Westboro selectmen to put illegal immigration questions on this year’s town ballot, census numbers for Massachusetts and the United States’ recent involvement in Libya. Please tune in on Fox25 tomorrow morning at approximately 7:15am for our lively discussion. Next week Representative Brad Hill and I will be hosting an open-to-the-public conference for constituents and municipalities interested in learning more about Post Employment Benefits. The conference is scheduled for Wednesday, March 30th from 7:00pm-9:00pm at the Manchester Essex Regional High School. Be sure to tune in to Channel 5 this afternoon, where I'll be providing an update on the efforts to clean up the thousands of waste filtration disks that have been washing up on area beaches since being released from a Hooksett, NH wastewater treatment plant two weeks ago. The Attorney General's office has responded favorably to a request by myself, Essex County Sheriff Frank Cousins and several of my legislative colleagues to investigate the release of these disks and to seek reimbursement from NH for local communities' cleanup costs. The segment is scheduled to air during the 5 p.m. and 6 p.m. newscasts. I have had several opportunities over the course of the past few days to speak with different media outlets of my efforts to reform the parole board. Two bills of particular importance that are being heard in today’s Joint Committee on the Judiciary are Senate Bill #891, which I filed and is supported by members of both parties and both branches, and House Bill #434, also known as “Melissa’s Bill”. Les Gosule, Melissa Gosule’s father, and I were guests on NECN’s “Broadside” with Jim Braude, WRKO’s Michele McPhee show, and Fox 25’s morning news. 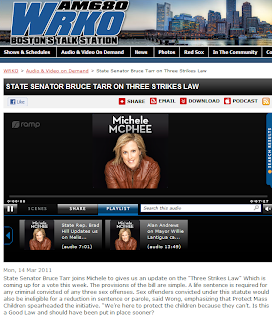 To listen to the segments please click on the media players or links posted below. Please click “Read more” to read a press packet that was presented during a Monday press conference in support of the bills at the State House. The packet contains the actual language and summaries of the two bills. Please tune in to “Broadside” tonight at 6:00pm on New England Cable News (NECN), where I’ll be discussing with host Jim Braude and special guest Les Gosule the upcoming Wednesday hearing where the Joint Committee on the Judiciary will be reviewing bills reforming the parole board, including one that I filed with a coalition of legislators. “Broadside” re-airs at 8:00pm and again at 3:30am. Tonight Representative Levy and I will be guests on “Nightside” with Dan Rea on WBZ NewsRadio 1030AM to discuss stricter laws and stronger penalties for those who prey on children. To listen to tonight’s discussion please tune in at 10:00pm or click “here” to listen online. On Monday the Senate Republican Caucus formally requested that the Joint Committee on Transportation and the Senate Committee on Post Audit and Oversight conduct one or more hearings to determine the causes of the many service disruptions in the MBTA Commuter Rail system that have occurred over the past several months. I signed the letters requesting such hearings with Senators Knapik (R-Westfield), Hedlund (R-Weymouth) and Ross (R-Wrentham), and they are posted below and can be viewed by clicking the link. The hearings we are requesting would provide an opportunity for the public, government officials, and transportation experts to identify the cause of the service disruptions and solutions to prevent them from happening in the future. 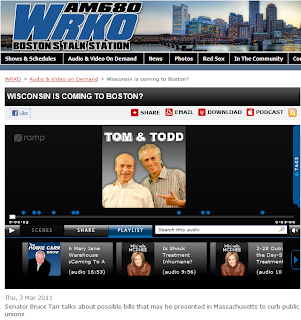 This morning I had the opportunity to talk with WRKO's Tom Finneran and Todd Feinberg of the "Tom and Todd Show". During today's interview we discussed Wisconsin Governor Scott Walker's recent labor union proposal, curbing health care costs for the state's cities and towns, and some Republican initiatives that would save the state money and lower the state's budget deficit. Please click the below picture to listen to today's segment. The Pioneer Institute is a Boston-based public policy research center that is celebrating its twentieth year of working to improve state government. Among the institute's more celebrated initiatives is an annual "Better Government Competition" which solicits, analyzes, and rewards ideas for making state government more efficient and effective. I have been honored in the past to serve as a judge for this competition, and it often provides the substance of legislative reform. Given its potential for positive reforms, I encourage you to develop and submit concepts for the competition. To read more about the competition, please click here to visit the Pioneer Institute's website.